Peak Terskol Observatory near Mt. 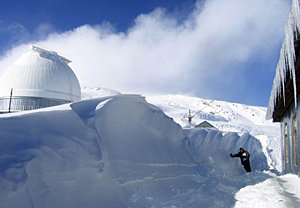 Elbrus in the northern Caucasus Mountains is participating in the Whole Earth Telescope's observing run. It is in the Kabardino-Balkaria Republic of the Russian Federation. Photo courtesy of Peak Terskol. 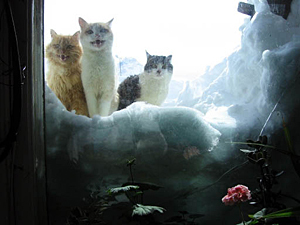 These cats at Peak Terskol Observatory in the Russian Federation are "real troopers" and like to observe. Photo courtesy Peak Terskol Observatory. The star highlighted in yellow on this finder's chart is the target white dwarf WDJ1524-0030. The stars marked with "c" also will be monitored during the Whole Earth Telescope's latest observing run. 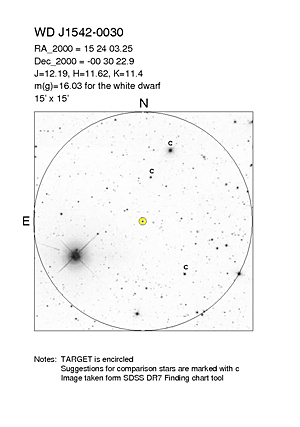 Editor's note: Prof. Provencal says you can view the target white dwarf WDJ1524-0030 if you have a telescope with a lens that is at least 6 inches in diameter and know where to look. Use the finder's chart on this Web page or on the DARC Web site. 3:24 p.m., May 15, 2009----The Whole Earth Telescope (WET), a worldwide network of observatories coordinated by the University of Delaware, is synchronizing its lenses to provide round-the-clock coverage of a cooling star. As the star dims in the twilight of its life, scientists hope it will shed light on the workings of our own planet and other mysteries of the galaxy. The dying star, a white dwarf identified as WDJ1524-0030, located in the constellation Ophiuchus in the southern sky, is losing its brightness as it cools, its nuclear fuel spent. It will be monitored continuously from May 15 to June 11 by WET, a global partnership of telescopes which was formed in 1986. Like an international relay team, observers at Mt. Cuba Observatory in Greenville, Del., will focus on and photograph the white dwarf until sunrise, and then observers at McDonald Observatory in Fort Davis, Texas, and at Kitt Peak National Observatory in Tucson, Ariz., will stand watch while the star is in their sky, followed by observers in New Zealand, Australia, China, and so on, around the globe. The thousands of photographs of the white dwarf taken by WET will be e-mailed to the command center at Mt. Cuba Observatory staffed by University of Delaware researchers, for archiving and eventual analysis using the fledgling science of “star quakes” known as asteroseismology. 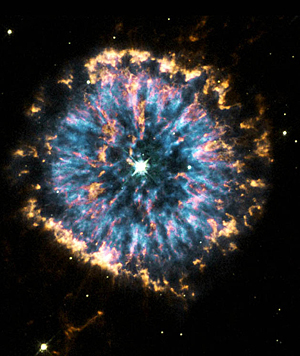 “A white dwarf is the size of the Earth and as dense as the sun. This star pulsates or quakes as waves of energy travel through it -- its outer surface sloshes from side to side, like waves on the ocean,” says Judi Provencial, assistant professor of physics and astronomy at UD and director of the Delaware Asteroseismic Research Center (DARC). There are thousands of white dwarfs in our galaxy; however, only about 30 percent are bright enough for scientists to study using asteroseismics, which can determine the age, temperature and composition of a star from its oscillations and brightness. Provencal says that WDJ1524-0030 is one of only about 20 percent of the stars in the universe whose atmosphere is composed of helium versus hydrogen. The WET team hopes to find out the composition of the star's core, whether hydrogen or oxygen. The process of discovery will take on the order of two years to stitch together all of the images, analyze the data, interpret the data with the input of the WET community and report the results. Eventually, the findings will be applied to other stars, including the sun, and to our own planet, Provencal says. Organizing all of the telescopes for an observing run may seem akin to aligning the planets. More than 20 telescopes are participating in the current run. 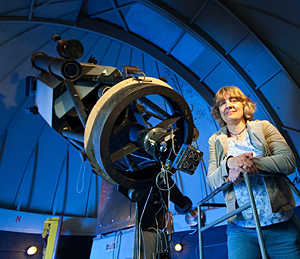 Provencal and Susan Thompson, co-director of DARC, needed to submit applications for some of the major telescopes several years in advance. 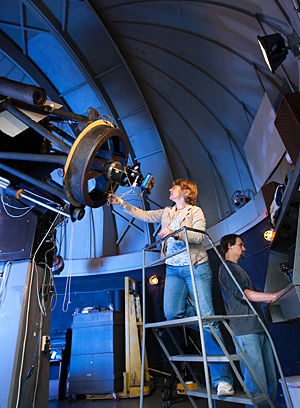 Only one in five proposals typically gets selected by such competitive research facilities as the William Herschel Telescope in the Canary Islands. With a lens that is 4.2 meters in diameter, the telescope is the largest that has signed on to participate, Provencal says. Before the advent of the Internet, Provencal says she and her colleagues at the command center used to have to call each observatory on the telephone to participate. While the administration of the Whole Earth Telescope is supported by the Crystal Trust Foundation, the observers are not paid to observe.